LANALLAH __Islamic BlogZine__: WHAT IF YOU FIND A WATCH IN THE SAND? 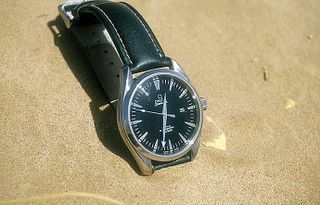 Of course, no sane person would say the watch just happened to emerge from the sand. All the intricate working parts could not simply develop from the metals that lay buried in the earth. The watch must have a manufacturer. If a watch tells an accurate time, we expect the manufacturer must be intelligent. Blind chance cannot produce a working watch. But what else tells accurate time? Consider the sunrise and the sunset. Their timings are so strictly regulated that scientists can publish in advance the sunrise and sunset times in your daily newspapers. But who regulated the timings of sunrise and sunset? If a watch cannot work without an intelligent maker, how can the sun appear to rise and set with such clockwork regularity? Could this occur by itself? Consider also that we benefit from the sun only because it remains at a safe distance from the earth. A distance that averages 93 million miles. If it got much closer, the earth would burn up. And if it got too far away, the earth would turn into an icy planet making human life here impossible. Who decided in advance that this was the right distance? Could it just happen by chance? There is no power or might except Allah The Most High,The Great. Hope u are well, and in the best of imaan.Ameen. Keeping well with ur duas. Jazakillah for the kind words,may Allah accept our efforts.Ameen. Ur blog is really inspiring masha Allah-keep it up! any good is from ALLAH any bad is from my nafs n the shaytaan. Pls rememba me in ur duas, i need them BAD, i never knew how hard it was to carry out research!I have to hand in my complete study on friday!